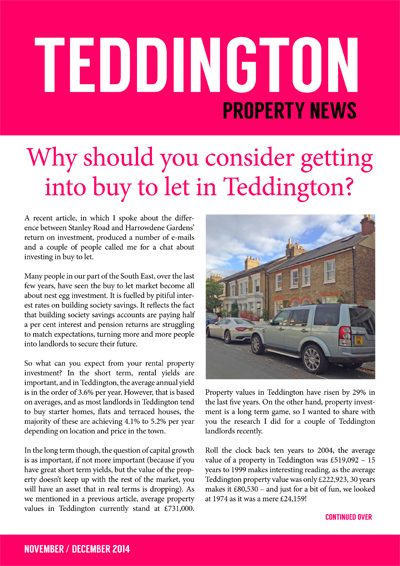 The new issue of Teddington Property News, which can be downloaded for free here, or read below, features up-to-the-minute news and advice for local property investors, landlords, those considering buying an investment property, or home-owners seeking to re-mortgage their existing home. The November/December issue of the popular local property magazine features an article by Steve Padgman, head of the mortgage department at The Financial Planning Group, who looks at the best buy to let mortgage options and products on the market. Local property services specialist, Rebecca Smith, has written a fascinating piece about Teddington property price rises over the past 30 years, and compares them to building society accounts and stock market performances during the same period. Stone Rowe Brewer LLP partner, Elizabeth Cobb, shares her knowledge regarding the pitfalls some landlords face when purchasing a property with a tenant in situ, whilst local architects, Geoff Beardsley and Partners, highlight how innovative design solutions can maximise profits on any residential conversion project. To read the articles in full, please download the PDF version of the magazine here, or see the articles below. Why should you consider getting into buy to let in Teddington? A recent article, in which I spoke about the difference between Stanley Road and Harrowdene Gardens’ return on investment, produced a number of e-mails and a couple of people called me for a chat about investing in buy to let. Many people in our part of the South East, over the last few years, have seen the buy to let market become all about nest egg investment. It is fuelled by pitiful interest rates on building society savings. It reflects the fact that building society savings accounts are paying half a per cent interest and pension returns are struggling to match expectations, turning more and more people into landlords to secure their future. So what can you expect from your rental property investment? In the short term, rental yields are important, and in Teddington, the average annual yield is in the order of 3.6% per year. However, that is based on averages, and as most landlords in Teddington tend to buy starter homes, flats and terraced houses, the majority of these are achieving 4.1% to 5.2% per year depending on location and price in the town. In the long term though, the question of capital growth is as important, if not more important (because if you have great short term yields, but the value of the prop-erty doesn’t keep up with the rest of the market, you will have an asset that in real terms is dropping). As we mentioned in a previous article, average property values in Teddington currently stand at £731,000. Property values in Teddington have risen by 29% in the last five years. On the other hand, property investment is a long term game, so I wanted to share with you the research I did for a couple of Teddington landlords recently. Roll the clock back ten years to 2004, the average value of a property in Teddington was £519,092 – 15 years to 1999 makes interesting reading, as the average Teddington property value was only £222,923, 30 years makes it £80,530 – and just for a bit of fun, we looked at 1974 as it was a mere £24,159! However, if one looks at, say, a 30 year investment period, if you had put £80,530 into the stock market in 1984 instead of buying a house in Teddington, your shares today would be worth £531,085. Put the same £80,530 money in a Building Society account and you reinvested the interest back into the account, and your Building Society passbook would have £434,076. Compare that with the property market in Teddington and the property would be worth £731,000 today. Pretty impressive figures by themselves until you realise that with the rental property you would have received in excess of £271,080 in rent over those 30 years, which you wouldn’t have received with the Building Society account! If you are looking for an investment property in or around Teddington but don’t have the time, or you simply need some help and guidance, then please do contact me. I have recently launched a property finding service where I take all the legwork away from you. If you want your weekends free from trawling the property portals and doing wasted viewings, then send me an email at rebecca@rebeccasmithpropertyservic-es.co.uk to find out more! Getting the very best mortgage advice is key! Whilst buy to let mortgages rates have reduced significantly, and so are often the best way of funding such a property purchase, there is often a better, alternative method of funding your potential buy to let purchase. option is to raise the amount required to purchase the buy to let property against your main residence. The benefit of this method is that you are borrowing at residential rates which offer significantly reduced costs; reduced rates of interest, lower arrangement fees and a far broader choice of products. Another major benefit of using this option is that dilapidated/derelict properties that are usually un-mortgageable, become a viable option. The money you have raised on your main residence can be used to purchase the property of your choice. At the time of going to print, you could borrow at a rate of 1.49% on a residential mortgage with an arrangement fee of £999, with buy to let mortgages starting at 2.05% with a whopping £1,999 arrangement fee. You are then in the enviable position of being a cash buyer when you find the property you want to buy. Don’t worry, tax relief can still be obtained on the money you raise in the same way that it could if you had borrowed the money on the buy to let property itself. It is the interest element of the mortgage payment that can be offset against the rental income not the total mortgage payment. There are of course some people who do not wish to re-mortgage their main residence having spent many years repaying the debt and of course in these circumstances there is a wealth of buy to let deals to choose from. Did you know you can now convert vacant offices for residential use? But time is running out! We recently worked with a client where we were asked to collaborate as Architects on a mixed business and residential development on the corner of Shacklegate Lane. We were approached by two local businessmen who had a semi-derelict site and wanted to develop it to maximise their investment. We obtained a good planning consent for three houses and four workspace units which, in our opinion, made the best and most profitable use of the space. Our skilful design of the houses incorporated a bonus feature in the form of balconied mezzanine floors which effectively created a townhouse effect and an additional space in the roof. This unique feature provided an enhanced house type which, when they were first marketed in 2004, had a selling price in the region of £400,000 each for the three houses. When you take into account the TOTAL construction cost was approximately £450,000, including building the work-space units, it made it a highly profitable investment for the two local businessmen! This is a prime example of how we are able to demonstrate our ability to deliver best value to clients and we pride ourselves on our ability to provide innovative solutions to difficult planning problems. As Teddington based architects we are keen to share with the local business community one of our more successful work streams. We have cultivated the ‘added value’ approach following recent changes in Government legislation in permitted development which allows most vacant offices to be converted into residential use. This legislation has been in place since mid-2013 and lasts for three years, which means that it ends mid-2016. A prime example is one of our local projects known as Millennium House (pictured). The former bank is a four storey traditional brick built Edwardian structure, built circa 1908 for Barclays Bank, and has exceptionally spacious character spread over four floors. It was converted into five flats including a studio, a one-bed and three two-beds. Although we are not privy to the full financials of the project, we were told on good authority that, as you would expect, it was a highly profitable project for the team that developed it! We have carried out other similar projects locally in Twickenham, Kingston and New Malden and are looking at a number of other opportunities for new clients who are business portfolio holders or have property requiring the ‘added value touch’ we specialise in offering. Please do give us a call on 020 8614 4374 if you have a project you are thinking of working on or are in need of a skilled and creative architect. We are happy to offer expert advice where possible. We had a landlord visit our office a couple of weeks ago who was looking at purchasing his next buy to let investment. He’d already chosen the property but it had a tenant living there. It was therefore being sold with a tenant in situ and he didn’t know how this would affect the sale of the property and him letting it going forwards. He wanted our advice on how to handle this so that he could ensure he was adequately protected. Often, following completion of a purchase of a property which is subject to an Assured Shorthold Tenancy (AST) agreement, insufficient thought is given to the way in which the tenant’s deposit is held under a Tenancy Deposit Scheme (TDS). The legislation does not specifically deal with this situation and currently, each authorised scheme appears to have a different approach and some do not specify any way to deal with this at all. Whilst this has been the subject of discussions between the Department for Communities and Local Government (DCLG) and various law firms, the DCLG appear to anticipate that selling and buying landlords will sort out the deposit payments between themselves. But what happens if the buying landlord is not provided with any details of the deposit by the selling landlord? Ask the selling landlord to provide all available information regarding the deposit scheme it is using. Think carefully about which scheme administrator to use and read carefully all the terms. Make sure the terms of the scheme administrator will accommodate the anticipated circumstances. Ask your legal advisor to ensure the contract for sale contains adequate wording to deal with the position. Often it is not possible to simply terminate an AST and grant a new one. In addition, it is important to bear in mind that should you wish to evict your tenant this may prove difficult where the tenancy deposit protection legislation has not been complied with. For help in avoiding any traps when buying a property with a tenant, or in recovering possession of a property from a tenant who won’t leave, please contact Elizabeth Cobb or Caroline McBrearty at Stone Rowe Brewer LLP on 020 8891 6141.